How far is the flag exactly? When you're about to strike the ball, that is the first thing you need to know in order to choose the proper club. sCaddie Golf GPS will give you a precise answer to this, pinpointing your target via GPS coordinates and analyzing your golf skills. sCaddie Golf GPS manages variables such as average, maximum and minimum distances for the clubs, the player's handicap and the hole's difficulty and success rates, all in order to help you out in the course. Tired of being unable to know your score until the end of the match? 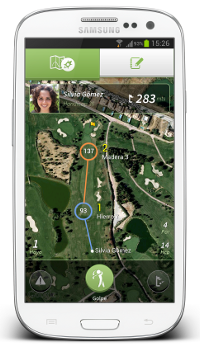 Don't worry, sCaddie Golf GPS will calculate each player's score so you can see your scorecard at any time. sCaddie Golf GPS will make the necessary calculations for you to adjust your handicap and that of the other players, so you will know how many extra strokes you will need for each hole. It will keep track of all the matches played, also analizing your performance. In sCaddie Golf GPS you will find every single golf course in Spain, in high detail, ranging from 9-hole courses to 18-hole courses and including Pitch & Putts. Did you know that, depending on the starting colour and the route, the par of a hole can change? sCaddie Golf GPS is the only app that takes these details into account, so you can get a more precise scorecard, according to golf rules and regulations. Do not settle for anything less. Have a look at our course list. You can store all the necessary information about you and the other players. 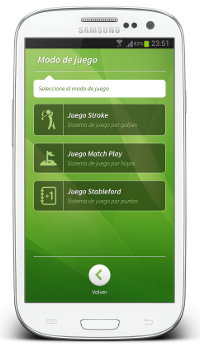 Select the clubs you are going to use so sCaddie Golf GPS can give proper advice at every moment. Insert your handicap and take a photo. 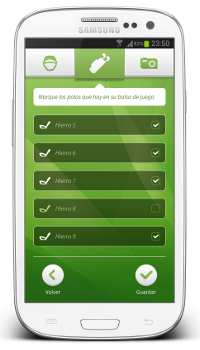 The interface is so simple and clear that you will never have a problem. sCaddie Golf GPS does not have ads, and offers you a free course to download. Why would you have to pay a huge amount of money for courses you will never need? Enjoy a course of your choice free of charge, and if you want more, you’ll find our packs in the downloads section.